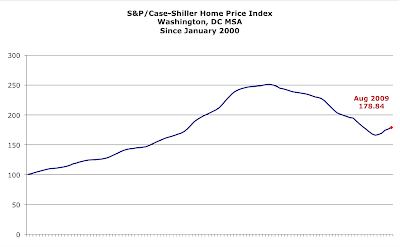 The S&P/Case-Shiller Home Price Indices report for August 2009 was released yesterday. The report show "that the annual rate of decline of the 10-City and 20-City Composites improved compared to last month’s [July] reading. This marks approximately seven months of improved readings in these statistics, beginning in early 2009." “Broadly speaking, the rate of annual decline in home price values continues to improve” says David M. Blitzer, Chairman of the Index Committee at Standard & Poor’s. “The two Composites and 19 of the 20 metro areas showed an improvement in the annual rates of return, as seen through a moderation in their annual declines. 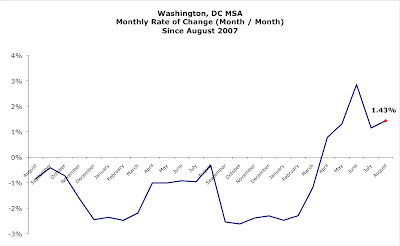 Looking at the monthly data, 17 of the MSAs and both Composites saw price increases in August over July. While many of the markets remain down versus this time last year, the relative rate of decline has shown some real improvement." 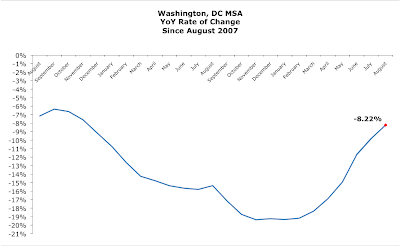 YoY, DC area prices are 8.22% lower, with prices increasing 1.43% July to August.